It is January 5 and the new Congress is meeting in Caracas. The governing party has taken all seats in the leadership for itself, chairman, vice chairman, secretary, vice secretary, and so on. The opposition, which won a 52% majority in the election, demands to be represented as well. The chavistas responded by yelling “murderer” and saying that the opposition has no right to demand anything at all in the Congress. The oficialistas got 98 seats from 48%, whereas the opposition got only 67 seats from their 52%. A 52% vote only gave them 40% representation. 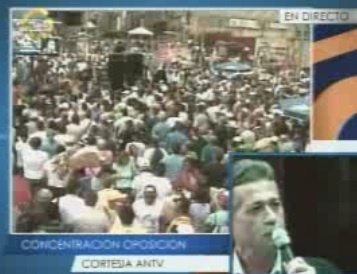 Opposition demonstration outside the Congress in Caracas, Jan 5, 2011, gathering tens of thousands of people. Two opposition congressmen are missing as they were sentenced to long prison terms a few days ago in kangaroo courts. One of them, Commissioner Mazuco, was advanced by the opposition as candidate for the vice president post. He was elected with 98,000 votes. The president of the congress, Soto Rojas, a former traitor of his country, only got 3,000 votes. The opposition soon after nominated Commissioner Mazuco as secretary of the Congress. At the moment he finished speaking, the Speaker asked his assistant what proposals for secretary there were. Just one, he said (the proposal from the chavistas, who won a 48% minority in the elections). He asked for the members to vote, they did by raising their hands. No recognition whatsoever of the proposal from the opposition (who won a 52% majority). Very strange meeting procedures, they would have been regarded as completely undemocratic where I come from. Not at least the fact that the chavistas by law have to vote for the proposal made by Soto Rojas; they cannot vote against it or abstain. If they do, they risk joining the growing ranks of political prisoners in the country. The meeting is ongoing at this time and can be seen live at La Patilla.